Making your own ice cream at home is rewarding and fun – and the good news is that whisky can help you produce delicious results. Martine Nouet reports. It is hard to think of a more summery dessert than ice cream, but lots of amateur cooks feel reticent about making their own at home. One of the reasons is that home-made ice creams tend to turn very hard and contain unpleasant ice crystals. Ice cream makers improve the texture, but can't prevent the crystallisation. But this is exactly where whisky can help. Aren't we lucky? Before offering some mouthwateringly luscious recipes and smart tips, let's understand the chemistry of ice cream-making and the techniques that can affect texture – without diving too deep into molecular gastronomy. First question: is it necessary to have an ice cream maker? It certainly helps to get a smoother and lighter consistency, but it is possible to make delicious sorbets and ice creams without it by just using a few tips. The basic components of ice cream are fat (milk, cream, butter), sweeteners (sugars, honey, syrup, etc), ice crystals (from the liquid), proteins (egg yolk, for instance) and other solids (fruit, nuts, flavouring, etc). Making ice cream involves combining different elements into an emulsion, which will offer a smooth and pleasant mouthfeel. It is important to avoid the separation of water and fat, which creates those unwanted ice crystals. Professionals use emulsifiers and stabilisers to get a perfect homogenisation. We don't have all this gear at home, and it is just as well. The choice of ingredients and their proportions is a decisive factor. The recommended ratio would be 60% water (found in cream or milk), 15% sugar, 10% non-fat milk content, 15% milk fat content. Dairy products prevent ice crystals from enlarging as the fat coats them. But too much high fat-content cream will give a cloying and heavy sensation on the tongue. Milk (especially skimmed or semi-skimmed) lightens ice cream. Lactose, like any sugar, lowers the freezing point of ice cream mixtures. This means that more of the mixture stays liquid at freezer temperature and the ice cream will be softer. But too much of it will help crystals to form. Adding salt will also lower the freezing point (think of a scrumptious salted caramel ice cream). Sugar has the same effect. Professionals will use ‘invert sugar’ for this reason. The right amount of sugar is not always easy to determine. Too much and you get a soft ice cream which melts instantly, not to mention the sickly taste. Too little and your ice cream will be as hard as a rock. Honey is a good natural emulsifier. Now we come to alcohol. Like sugar, it lowers the freezing point of a liquid. Again the proportions matter. You don't need a lot of whisky because, as you will agree, we only use excellent single malts which have a rich aromatic profile. As with sugar, too much whisky will turn your ice cream into slush – apart from the fact that the taste will be too pungent. Last point: it is important to freeze your mixture as quickly as possible; hence the use of an ice cream maker. The longer it takes, the more crystals you will get. Also, ice cream makers (the people, not the machines) recommend ‘ageing’ the mixture. Keep it in the fridge overnight before you turn it into ice cream. Both are delicious. In summer it is possible to get a wonderful selection of perfectly ripe fruit. I don't like adding whisky to sorbets as I think it spoils the flavour of the fruit, but I will serve the sorbet sometimes with a dash of whipped cream laced with whisky (a fruity Speyside malt or, with a citrus fruit sorbet, a young peated islander). Or I will just concentrate on the matching. One of my star ice creams in summer is marshmallow. 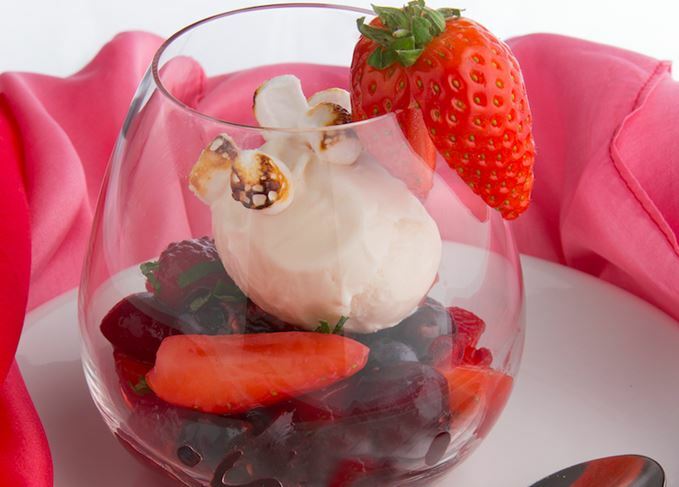 So easy to prepare: melt 200g of marshmallow into 50ml of double cream in a bain-marie. Add the juice and zest of a lime and 200g of yoghurt. Divide into glasses and place in the freezer. To get a smooth texture, take them out of the freezer 10 to 15 minutes before serving. Add strawberries and raspberries. I think whisky works better on ice creams. Start with a good home-made vanilla – using the best vanilla pods – crème anglaise (sounds so much better than custard) and let your imagination work from there, adding instant coffee, melted chocolate, caramel, raisins, nuts or candied ginger. Coffee ice cream with a good dash of Dalmore 15-year-old? Ginger ice cream and Lagavulin 16-year-old? Dark chocolate ice cream and Bowmore Darkest or Glenrothes Sherry Reserve? Salted caramel ice cream and Springbank? Nougat glacé and Glenmorangie Nectar d'Or? If you add raisins, chopped dates and apricots or any other dried fruit to your basic custard, soak them in whisky two days before (Aberlour 16-year-old, Balvenie 14-year-old Caribbean Cask, Highland Park 12-year-old to mention a few). I will never forget the first time I tasted a whisky ice cream. Years ago, I was invited on a press trip by Highland Distillers to Bordeaux House in Perth, the ‘House of The Famous Grouse’. The dinner was cooked by local ladies. Our hosts, marketing director and PR people, were the waiters. The dessert was a Highland Park ice cream and shortbread, all home-made. They had used Highland Park 12-year-old on a base of creamy custard. It was one of the best ice creams I have ever tasted. I often make it and in winter I add a few tablespoons of gingerbread chopped in a blender. Still feel you don’t have the skill of an apprentice ice cream maker? Here is an easy tip for you. This is not cheating, this is making the best of what is on offer. First, buy a very good vanilla ice cream. Place your blender bowl in the freezer for a few hours. Choose a single malt from your cabinet, plus maybe a solid ingredient: chopped meringue, candied orange, caramelised nuts, a spice, chocolate chips and so on. Place the ice cream in the frozen blender. Switch the blender on, add three tablespoons of single malt. Blend for one minute, then add your solid ingredients. Return to the freezer immediately and don't allow the ice cream to melt. It will take you no more than five minutes to enhance your ice cream. A complete bluff! Each of the 12 varieties matches a different Scotch Malt Whisky Society whisky flavour profile. Our Whisky Virgin is feeling the heat and on the hunt for cooler ways to enjoy his whisky. As the mercury nudges upwards, the Whisky Virgin discovers whisky was made for all weathers. A selection of some of the best al fresco watering holes to enjoy a whisky tipple this summer. Beat the heat with these refreshing sunny-day serves recommended by top bartenders.